MagicRAM 2.5″ SATA III SSD is a rugged SSD and extremely reliable storage solution in harsh environments with capacity up to 2TB and extreme SATA III performance up to 510/480 MB/Sec (Max). MagicRAM 2.5″ SATA III SSD is designed with SLC, pSLC, MLC or TLC NAND Flash and is available with an optional -40C to +85C extended temperature range version. 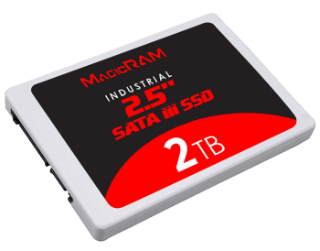 MagicRAM 2.5″ SATA III SSD offers many features such as Fast Secure Erase and AES256 Encryption as well as support for S.M.A.R.T, TRIM and Power Fail Protection and it is an ideal solution for a variety of applications, including embedded system, industrial computing, and enterprise field.